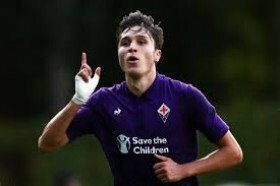 Manchester United and Manchester City are facing a blow in the pursuit of Federico Chiesa with Juventus said to be leading the race to sign the Fiorentina attacker. The 21-year-old has enjoyed a strong season with La Viola with 12 goals and eight assists and this has caught the attention of a whole host of clubs including the Mancunian giants. However, Gazzetta dello Sport claims that the Premier League duo may miss out on the attacker with the Bianconeri having already begun talks with La Viola regarding a possible transfer. Chiesa, who has netted six times in the Serie A this term, has a contract until the 2021/22 season with the Florence outfit. He is currently valued at around £70m by the club. The Bianconeri are likely to sanction player sales before pursuing Chiesa's signature in the summer and reports indicate that they could recoup a massive chunk of the fees from the departure of Douglas Costa.